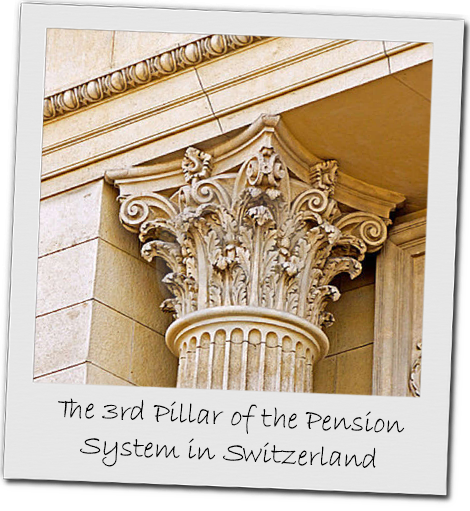 The benefits provided under the 1st (State AVS) and 2nd (Company) pillar plans are often insufficient to guarantee your existing standard of living at the time when you retire. You can compensate for this gap in coverage with an individual pension plan. There are broken down into “Bank” and “Insurance” driven models. Each has it’s own advantage, and so a careful and detailed explanation is absolutely essential before deciding on the model. Pillar 3a is supported by the federal government by means of fiscal policy measures and for the promotion of home ownership. It enjoys a number of tax benefits, but is tied to certain statutory requirements. Bank-driven policies allow for flexibility in premium contribution, but have no guaranteed returns. The insurance –driven products include life cover and usually a guaranteed minimum return. Pillar 3b includes all savings, savings accounts, bonds, money market investments, equities, investment fund units, residential property, etc. The saved capital can be withdrawn at any time. In contrast to tied pension provision, flexible provision generally enjoys no tax privileges, but under certain conditions capital-accumulating life insurance policies are also tax-privileged. Here too it is important to get expert advice – in plain English. Spectrum advisors are available to help explain and select the right product for your personal goals, but given that these are almost the only tax-deductible savings available in Switzerland, any new arrival to the country should be looking to take the fiscal advantage whilst planning for their retirement.